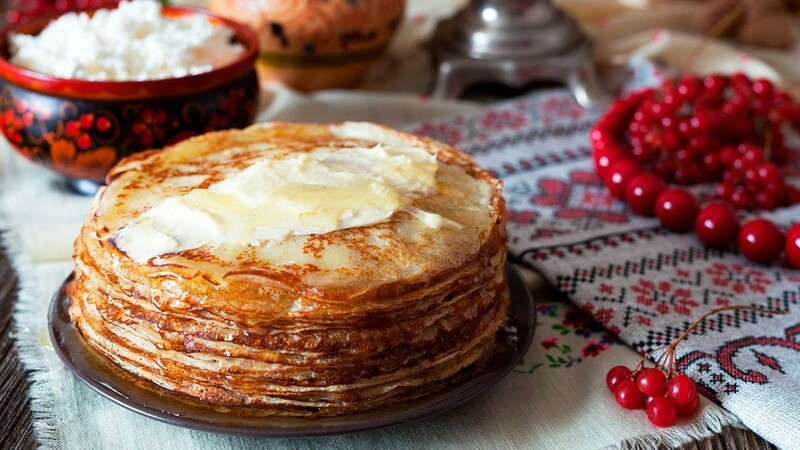 The taste of blini is known across the globe. Syrniki, golubtsy, and Olivier salad are known across the globe - so why don’t we see more street kiosks serving Russian food, compared to the usual joints offering Asian wok dishes or American burgers? Russian cuisine has always required a rather serious attitude: Salads and soups with many ingredients and sauces, all of which must be tasted to comprehend. Russian cuisine “requires the full plunge, and concentration to explore why there are so many bitter, pickled, and sour flavors,” said Alexei Zimin, chief editor of the online magazine Afisha.Eda. In this regard, Russian gastronomy can’t be adapted for mass consumption because it requires that customers be prepared. The cooking of many traditional Russian dishes takes time, something that modern people don’t have much of. Therefore, the likes of kholodets and stuffed duck are only prepared during special occasions, usually Christmas. 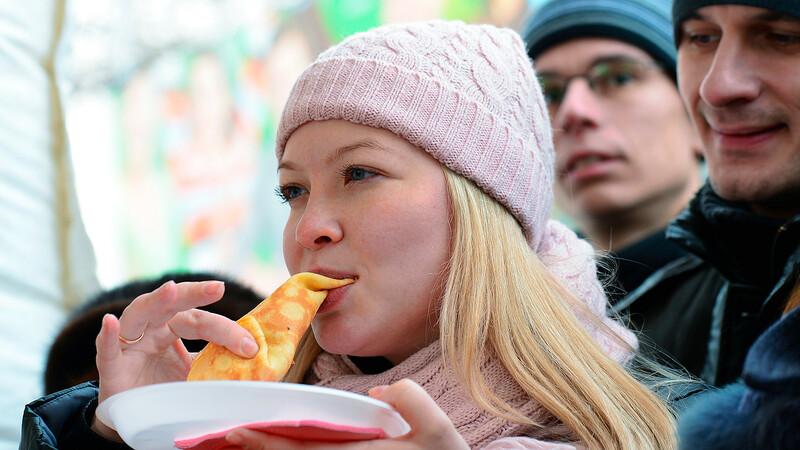 A young lady eats pancakes during Shrovetide festivities in Moscow's Gorky Park. When did the Soviet diet replace traditional Russian food? Let’s look at the experience of another European country. Take Vienna, for example, where it can be hard to find a restaurant with non-Austrian cuisine. In Moscow, however, it’s even harder to find a restaurant with traditional pre-1917 Russian cuisine. One reason is that the tastes of Imperial Russia are not to the liking of many people today, and have been forgotten. An example is the soup yurma, which was cooked from fish and chicken; while one of the popular desserts at that time was radishes in honey. "Traditional cuisine is sophisticated, and few people cook it at home," said food blogger Daria Sokolova. Of course, some Russian dishes were included in Soviet menus – pirozhki, borsch, and pelmeni. "But everything else is too complicated, for example, like cooking a pheasant. I don't even know what one looks like." On the contrary, many restaurants in Russia have a Soviet theme, and the most famous are Varenichnaya, Yolki-Palki, Mu-Mu, and Grabli, all of which offer simple Soviet-style meals - vareniki, cutlets with potato puree, compote, etc. They’re usually more popular with foreign tourists, who prefer to sample such cuisine. Time Out magazine makes an annual rating of Moscow’s best restaurants based on readers’ votes and expert opinions. The 2016 rating was topped by Georgian and Moroccan restaurants and a smokehouse in the trendy Danilovsky Market. Why are there no restaurants serving Russian cuisine topping the list? The answer is simple. Russians themselves cook better bliny, thick soups, and cutlets; so why should they go out to eat such meals? Why no restaurants serving Russian cuisine at the top? The answer is simple. Russians can themselves cook better bliny, thick soups, and cutlets; so why should they go out to eat such meals? The cooking of most traditional dishes takes time. "It’s also due to the years of the Iron Curtain," said Daria Sokolova. "People ate cutlets for 70 years without any alternative, and now they want to drink cola and eat croissants." Meanwhile, when chiefs experiment with “new” Russian cuisine, the result is often wonderful. 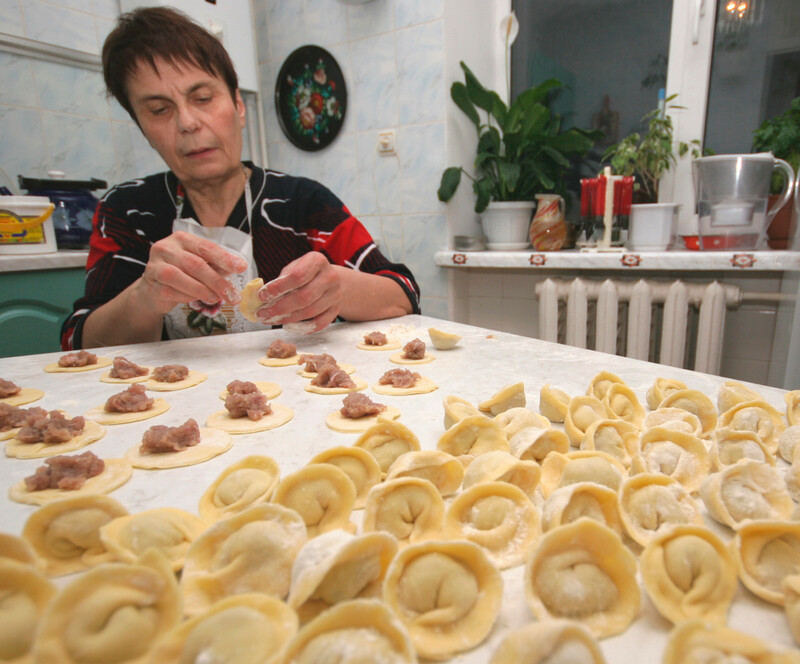 Moscow restaurants such as Pushkin, Kuchmisterskaya and Dr. Zhivago recall old Russian recipes, and they reinvent shschi, kholodets and pelmeni. Judging by the enthusiastic reviews from both diners and experts, it’s clear they’re succeeding. What’s the situation with Russian restaurants abroad? 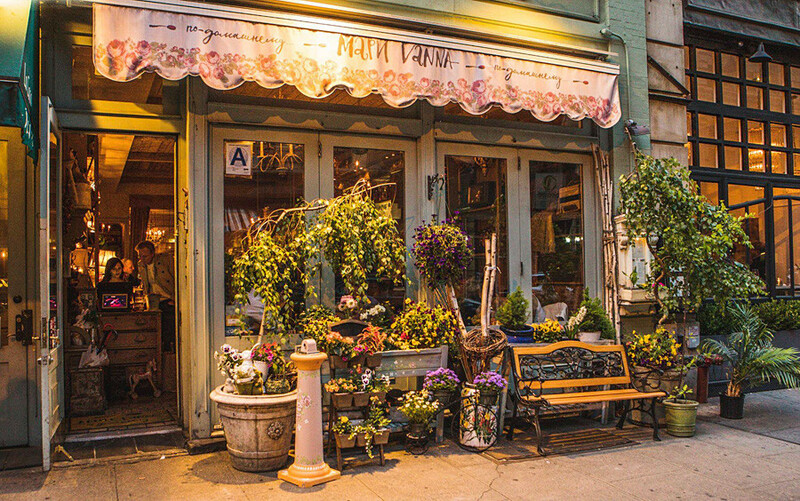 Some are very popular, such as MariVanna and Russian Samovar in New York. Teremok, a fast food chain for Russian cuisine, recently opened two cafés in New York. In October, Business Insider praised Teremok in the U.S. for its “quite reasonable” prices (nothing is over $10), and “authentic” cuisine. At the same time, Teremok’s director, Mikhail Goncharov, complained that in Russia his business could close in the next couple of years. “We can’t cope with the rent. New players are appearing - craft burgers, and Asian cuisine,” he wrote on Twitter in October.